(Newser) – In 2012, researchers pinpointed the location where Julius Caesar was murdered—but the spot was accessible only to a colony of cats. 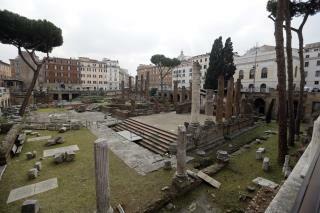 That'll change come late 2021 thanks to the high-end jeweler Bulgari, which is funding the restoration of the Rome site known as Largo Argentina. The AP reports the ruins of the temple complex sit below street level, which has given tourists a sight-line from above. With what ANSA reports is about $900,000, walkways will be built within the site so tourists can get close. "Digging up a concrete structure stone pedestal about 6.5 feet tall and 10 feet wide changed that. It was erected by Augustus, "to condemn the assassination of his father" this article states. Julius Caesar was not Augustus's father. " His maternal great-uncle Julius Caesar was assassinated in 44 BC, and Octavius was named in Caesar's will as his adopted son and heir." In most cultures, the adoption of a child does not change the identities of its mother and father: they continue to be referred to as such. Those who adopted a child were thereafter termed its "guardians," "foster," or "adoptive" parents. I thought you would want to know that and you are welcome. Interesting timing of this article - watched "Cleopatra" on TV the other night. Hadn't seen it since it first came out when I was a kid. Really impressive, well-made flick. I'd love to see Rome.. ahh, the history!